Questions Asked in IDBI Executive Exam: IDBI Executive exam has been conducted today, in two Shifts and the level and pattern of exam this year were Easy to Moderate level. 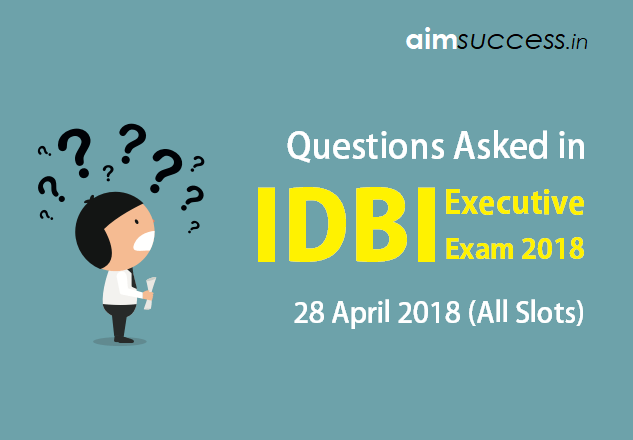 In this article we are sharing some Questions Asked in IDBI Executive Exam 28 April 2018 This detailed Exam Analysis & Questions Asked in IDBI Executive Exam will help you identify the latest trends of Banking Exams, and will also prove to be helpful for the upcoming SBI & IBPS Exams 2018. This IDBI Executive Exam Analysis has been updated based on the reviews shared by the aimsuccess users who appeared for this exam. 1. 4, 2, 2, 3, 6, ? 2. 5, 6, 13, 40, 161, ? 3. 7, 10, 19, 46, 127, ? Difference is multiple of 3. 4. 16, 9, 10, 16, 33, ? 5. 6, 7, 15, 42, 106, ? Directions (Q. 6-10): In the given questions, two equations numbered I and II are given. Solve both the equations and mark the appropriate answer. 11. Ravish allowed a discount of 30% on the marked price of Rs 15000 on an article and incurred a loss of 12.5%. What discount should Ravish allow on the marked price so that he gains Rs 750 on the article? 12. The investments made by M & N are in the ratio 3 : 2. If 15% of total profit is donated and M gets Rs 9180 as his share of profit then what is the amount of total profit? 13. The present age of the father and the son are in the ratio of 8 : 3. After 12 years the ratio of their ages will be 2 : 1. What is the sum of the present age of the father and the son? 14. X can do a work in 60 days. Y can do the same work in 40 days. Z takes as long as X and Y would take together. How long will A, B and C take to complete the work together? 15. A sum of money is divided among A, B, C and D in the ratio of 3 : 5 : 7 : 11. If the share of C is Rs 560 then what is the total share of A and D together? Two passages – One based on Economics and Development. Five questions each were asked on Cloze Test, Sentence Improvement, Error Spotting and Double Fillers. Four puzzles – 2 Straight line , 1 Circular, 1 based on Sports. ‘n’ number of people , one seated in the straight line facing North, such as the two between P & Q. Eight people seated in straight line facing North. Each person is from different state, such as Rajasthan, Haryana, Manipur, Tripura, Kerala, Punjab, Assam, Telangana, respectively. Five questions asked on arrangement. Eight people seated around Circular table. L,M,N,O,P,Q,R,S. Some are facing towards centre and some are facing opposite to the centre. S sits second to the right of O. There is only one person between S & L.
The number of student between Pooja and Mira are same as between Mira and Ridhi. Find the rank of Mira. Five questions on Coding – Decoding. Five questions on Yearly Sports Events. 6. Blood Relation : Where Square indicates Male and Circle indicates Female.